WineTown is back in Florence this weekend and thanks to Studentsville I won two tickets to last night’s inaugural event and two WineCards for all weekend festivities. A photo of me enjoying wine, chocolate truffles and a cigar in Lucca was the winning image of the “I Love WineTown” contest they had on Facebook. 🙂 I guess it pays to be a glutton. The inaugural event was at LOFT E’ which is known to throw some chic events in Piazza del Carmine in San Frediano. There were top chefs cooking and serving all of us hungry winos. 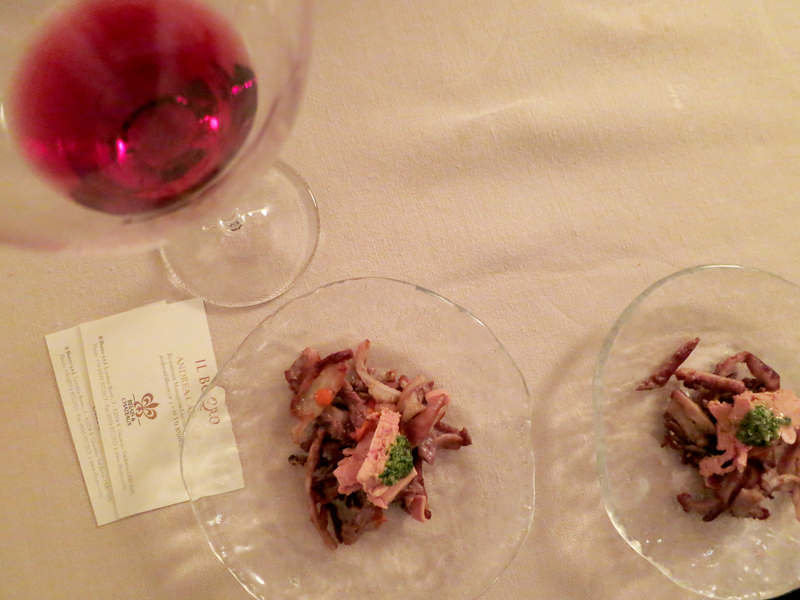 My favorite (above image) was fried lampredotto (cow stomach) topped with patè, the real deal. 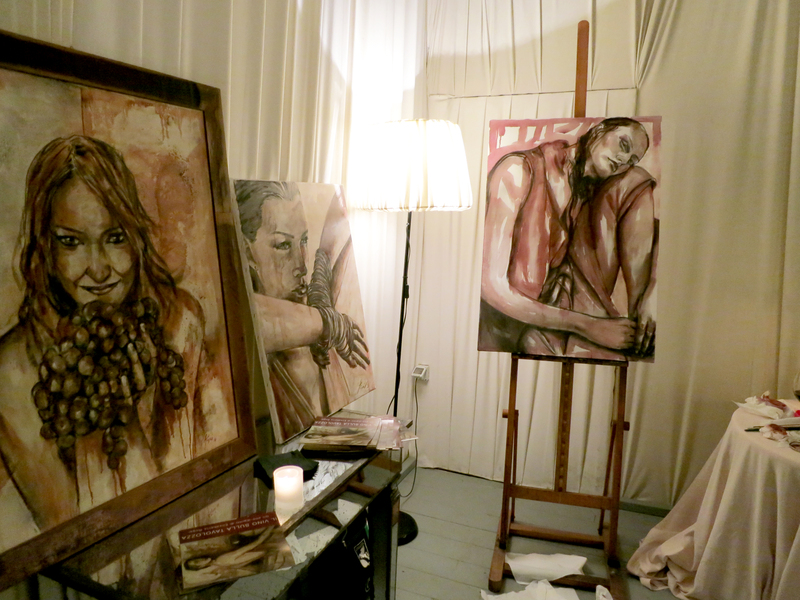 A nice treat was art work from Elisabetta Rogai who paints with wine! The pieces were gorgeous—something I would love to hang on my wall. Even more interesting is the fact that as the wine on the canvas oxidizes the color darkens and changes over the first two years. The artwork is basically ‘alive’, so cool. Small world because my husband has known her for years, so it was very nice meeting her. This weekend marks WineTown’s fourth year in turning the streets and piazzas of Florence into one huge wine bar. This year there will be beer, which will be a great new addition. I love artisan Tuscan beer! You will need to get a WineCard in order to participate in the wine fun! One card runs €15 for 5 tastings on Friday night and if you renew your WineCard for Saturday it’s €10. Look for them at any palazzo where the event is taking place. Besides the abundance of wine events all throughout town there are also free events all night: WineTown concerts and WineTown performances. Unfortunately those links are all in Italian, but you can get a gist of what you may want to check out. You may be asking “is there an app for that?” well yes, yes there is a WineTown app! You can check out all the wine ahead of time and see which piazza/palazzo you want to visit based on the wine and beer list, pretty cool, giving you no reason to be disappointed. Follow WineTown on Twitter, Facebook and check out their site for more details. Don’t forget to follow Studentsville on Twitter and Facebook for all Florence events, tips and great apartments! Hooray you won! I’m sure it was even better than you recount! Haha, I won all three days of tickets, but since I had weekend plans in Venice, I gave the Friday-Saturday tickets away. I wanted to win the inaugural private event! Eye on the prize. It was great, tried a few types of wine and interesting food. 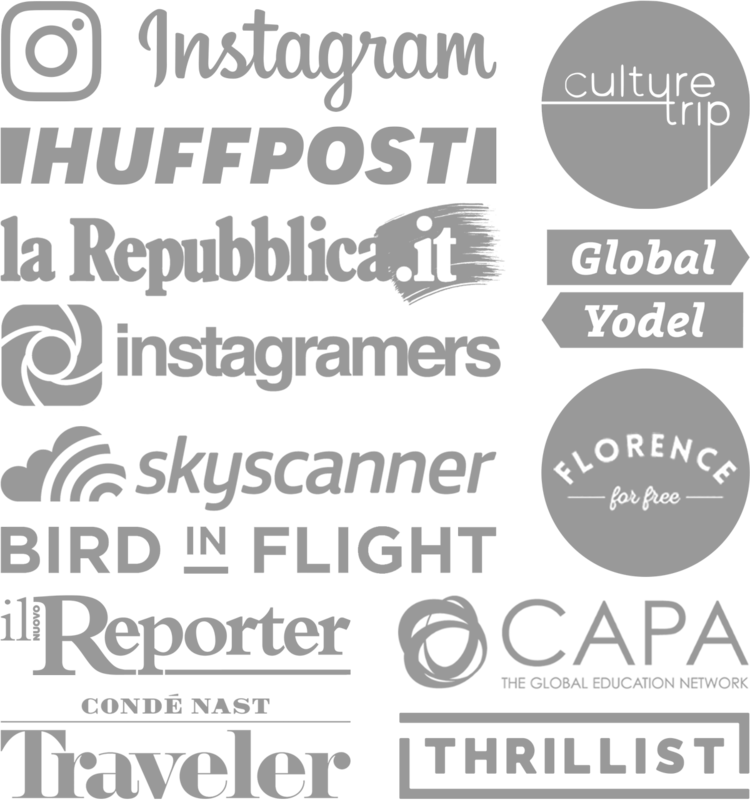 Be on the look out for some great blog tours, I’ll be in Cesenatico this weekend with about 30 bloggers. Let me know if you pass by Florence!